Your breathtaking river cruise begins on the Rhine River in Basel, Switzerland. You’ll sail to Breisach, your starting point for a Black Forest excursion, and to the city of Strasbourg, France, along the way. Sail to Rüdesheim and through the spectacular Rhine Gorge. 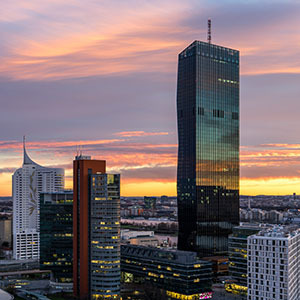 The modern and charming city of Frankfurt is also on your route along the Rhine, and you’ll sail on the Main River to visit an authentic village. Visit Würzburg, and take a guided tour of Bamberg, before reaching Nuremberg, from where you will take a full day excursion to Munich. Sail from Nuremberg to Regensburg, the only German city not bombed during WWII. Cruise next to Passau, with its narrow streets and baroque St. Stephen’s Cathedral. In Melk, you will visit Austria’s majestic Benedictine Abbey. Take in the breathtaking views before continuing through the picturesque Wachau Valley to the romantic sights of Vienna, the “City of Music.” Your European river cruise vacation ends in Budapest, the capital of Hungary, with guided sightseeing and free time to explore this vibrant city on your own. The second largest city in Switzerland, Basel is spread out on both sides of the Rhine river. The left bank is called the Grossbasel, and the part of the city located on the flatter right bank is Kleinbasel. has reason to be proud of its intellectual and cultural importance. The first university in Switzerland was founded here and Basel famously became the centre of humanism inspired by the visionary Erasmus von Rotterdam. Throughout modern history, great scholars have taught here including the physician Paracelsus and the philosopher Friedrich Nietzsche. A city of enormous appreciation for the arts, Basel boasts 267 museums, a grand new theatre as well as folkloristic gatherings and numerous civic festivals. The biggest event of the year is the Basel Fasnacht when the whole city takes part in the three days of high-spirited celebrations. This former capital of Germany is located in the southwest area and is the major commercial center. The Main is a river in Germany, 524 km (329 miles) long (including the White Main, 574 km (357 mi)), and it is one of the more significant tributaries of the Rhine. Along its banks, you will often find picturesque Bavarian villages that would delight any photographer’s eye. Rüdesheim is a small, very quaint “Bavarian” village in Germany on the Rhine River. Points of interest include the Asbach Brandy Distillery, Cable-car to Niederwald Monument, Medieval Museum of Torture, a Falconry and many wine festivals throughout the year. The ancient capital of Alsace it is located in the northeast corner of France near the border with Germany. The city has exchanged hands between France and Germany during the World Wars. It is considered to be at the “crossroads” of Europe and is the home of the European Parliment. Visit the Palais Rohan, home of many famous paintings; La Petite France with its ancient structures; the famous Church of St. Thomas; and the Cathedral of Notre Dame, built in 1439 and the largest building of its type in the World.